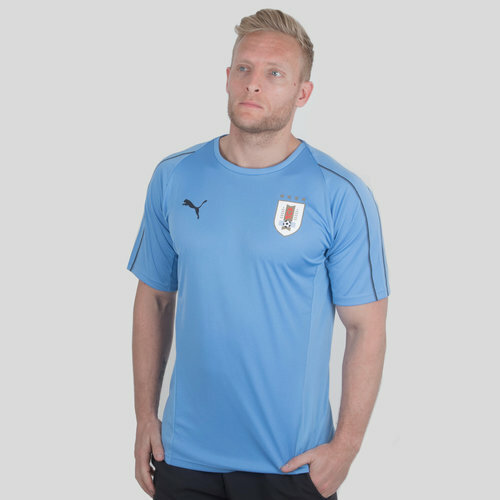 Fly the flag for the Uruguayan national team and translate your passion onto the footie field when you pull on the Puma Uruguay 17/18 S/S Football Training Shirt. This training shirt from the Uruguay nation team features an impressive silver lake blue colourway which is sure to put smiles on the faces of the loyal fans. 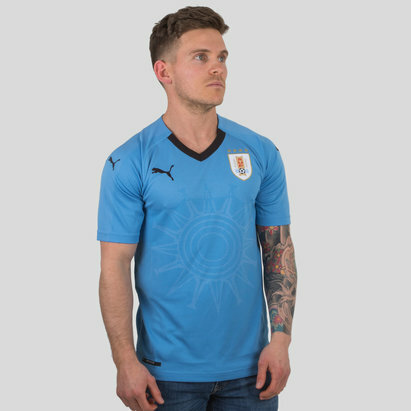 Both the Puma logo and Uruguay badge have been heat pressed upon the shirt which will limit irritation on the skin during wear times. Made from 100% Polyester, the shirt benefits from dryCELL Puma technology that is designed to enhance performance by drawing moisture away from the skin to help keep you dry and comfortable. The crew neck fit makes for a relaxed style that puts comfort first.